This is a very well bred Class 1 mare who goes back to The Admiral, Kimble, Thunder Storm and Tantallon Bobby. She currently measures at 147cms(14.1 hands) and we beleive will finish up at 148cms (14.2 Hands). She has superb movement and basically floats across ground. Easy to catch, load,attend farrier and no known vices. She attended her 1st show at Bailieborough and out of total entries of 13 was placed 3rd. On the 24th July 2011 Hannah was placed 3rd in the 3 year old class with 17 entries at the Midlands Show. 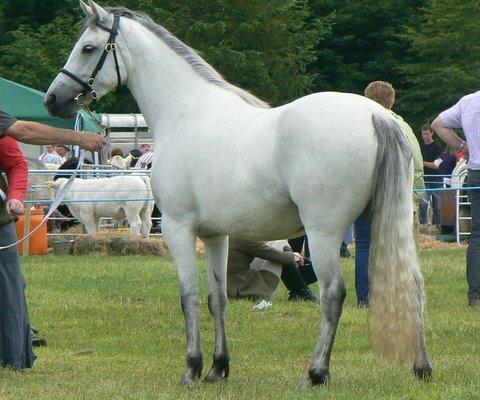 On the 27th July 2011 at Clogher Valley show she qualified for the mare of the future all Ireland Championship. She was placed first in a strong class of 3 year old fillies and geldings. She then went on to qualify for the National Pony Society Championship. We beleive she will make a super ridden pony with Hoys in view and the potential to go to the top in any equestrian sphere. She also has the pedigree to be a valuable brood mare. Hannah can be seen by going to you tube and typing in her name . There are 2 short videos of her.